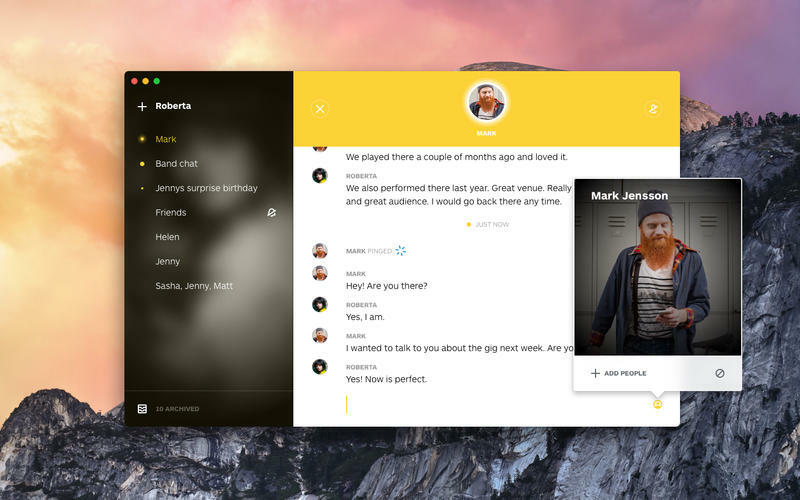 Skype co-founder Janus Friis is backing a new communications network called Wire, which is based out of Zug, Switzerland, and Berlin, Germany – and is led by a bunch of ex-Skypers. [company]Wire[/company] offers voice calling and one-to-one or group messaging, and users can also share pictures, [company]SoundCloud[/company] music and YouTube videos. As with other more fully-fledged communications services such as [company]WeChat[/company], Wire could arguably be described as a social network of sorts. It’s initially available for free on iOS, Android and OS X, though according to the Guardian an HTML5 browser version is in the works that will bring Wire to Windows PCs as well. The voice calling functionality uses in-house technology that supposedly delivers very good quality, though Wire is also compatible with standard WebRTC, the plugin-free technology that starting to power more and more in-browser voice, video and messaging tools – perhaps even Skype itself at some point. “We asked ourselves how modern communications could look and work. How could we take full advantage of the latest devices and advances in cloud computing to deliver something that is really simple, very useful and truly beautiful?” Wire CEO Jonathan Christensen said in a statement. Christensen actually spent six years at Skype, heading up audio and video engineering, then managing the general platform, then scoping out emerging opportunities. He left in 2012 after Microsoft bought Skype, and Wire has been quietly brewing ever since. The links don’t stop there – Wire CTO Alan Duric co-founded voice technology provider Camino Networks, which Skype bought in 2006, and product design chief Priidu Zilmer also led a design team at Skype. Meanwhile Wire’s chief scientist, Koen Vos, was behind Skype’s SILK audio-compression format and audio codec, introduced in 2009. He also co-created the open Opus audio-coding format, which incorporates SILK’s technology. It’s hard to make any judgements before getting some hands-on experience with Wire, but the team is more than credible, its Swiss base makes for a good pro-privacy jurisdiction – though Wire has not said anything useful about its security mechanisms yet — and it sure looks pretty. This article was updated at 2.30am PT to note, as fairly pointed out in the comments below, that we don’t know anything about Wire’s security yet. With messaging market leader WhatsApp now offering end-to-end encryption, this is of course a big deal. It’s all well and good having another good messaging service like Wire however the problem isn’t the quality of the services available, it’s connecting them up and making them interoperable. That’s what Matrix.org are trying to do. Imagine if all apps or messaging services were talking together. An open source ecosystem that was secure and one which you could plug into or intergrate with. At least that is what we are trying to achieve. Thoughts? Hmm, Jabber/XMPP, SIP have been available for ages, but siloed communication services have taken over for now. Jurisdiction is nice and all, but no replacement for full, end-to-end encryption.